I was covering the last world cup in New Zealand and this meant a week in Auckland for both semifinals and then the last two games. But those were on weekends, this meant I had a whole week in between with nothing to do, so I decided to head home for a short break at my Mum’s place in Tauranga. For those who don’t recall or aren’t from New Zealand, the biggest news behind the world cup was an environmental disaster called The Rena. A cargo ship, run aground and leaking tonnes of oil onto a white sand beach resort. In my head this was my beach. 1346 tonnes of oil remain on the ship. $3.5million has already been spent on clean up. …not tackles and metres gained. Rugby is sport, and sport is, at it’s heart, just a form of entertainment. A diversion. This was people’s livelihoods, from tourism to fishing, not to mention the massive environmental impact. I took a walk in the sunshine along the main section of the beach that had just been reopened and saw thick black patties of oil everywhere. the water looked sparkling and clear, but I was told the dispersant used kept the oil just below the surface so it was still there just harder to see. 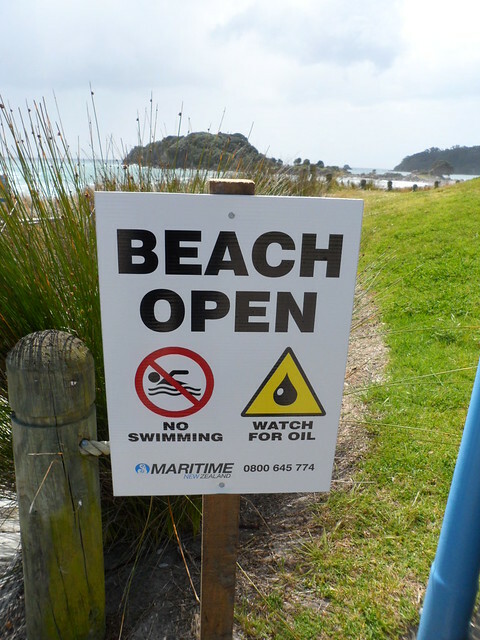 The signs were clear: the main Mount beach was open, but the water was closed. This did not mean the beach was empty. The sun was shining for a time and there were quite a few tourists around and kids playing everywhere. Some rather clever person had written huge letters in the sand spelling out “Clean Me”. It was surreal. Black everywhere. From the flags of All Black supporters to oil strewn beaches. Four years later, the wreck is still there. The company that owns it has petitioned to leave it there, paying a few million dollars to leave the rotting ship on the seabed. “Four more years” takes a completely different meaning. A classic moment in a classic game. Though actually it would be another eight. I think his first name was actually Bloody or something a bit stronger beginning with ‘F’ and ending with ‘Arken’. A thorn in our side for years, but one of the finest players to have graced the game. The only redeeming feature of the this match was that they went on to lose the final. I think that would have been more humiliating than going out of their own tournament in the semi’s to us. I’d been at the England v Aus game that afternoon (I’m Welsh) in Marseille and was on the ale in Avignon watching France beat New Zealand. I made ‘friends’ with an Australian girl that evening that lived in the UK and made plans to go see her (so we could be um…. friendly again) at least once more. Next day was Fiji v SA (I had tickets as I had hoped this was the QF that Wales would be in) and I put all such earthly distractions out of my head….quite far out of my head as it happens. I get home and myself and the friendly Aussie girl exchange emails and she sends me a photo of her and I (and her mate) drunk as lords the evening we met, she is holding a bottle of wine and has a Green and Gold scarf round her neck. So I email back to confirm my travel arrangements and comment that I hope she’ll have better dress sense when she comes to meet me as that scarf shouldn’t really been seen in decent company. Her final email to me is to confirm she’ll see me at some pub at 7:30, she is looking forward to seeing me that night and by the way … …. As it happens she saw the funny side and friended me to within an inch of my life that weekend. The All Blacks and and Scotland are both in the quarter-final rounds this weekend. Back in 1999 they were facing each other, in a game that most people in New Zealand at least, don’t remember because of what happened the week after against the French. Scotland appeared in arguably one of the uglier rugby strips of the 1999 RWC, and featured Gregor Townsend, Wellingtonian Martin Leslie at number 6, and the dual code legend Alan Tait – who’d made his union debut at the 1987 RWC.